Eugenie Bouchard, currently ranked No. 116 in the world, was a top-five tennis player once upon a time. Rewind back to her 2014 season, when she reached the Australian Open and French Open semifinals, then the Wimbledon final, and surged to a career-high No. 5. Her success slowed in 2015, but in September, she found herself in the middle of a promising U.S. Open run, making the fourth round in the singles draw. Then, after winning an evening match with mixed doubles partner Nick Kyrgios, she entered the women’s locker room and passed through the trainers’ room to reach the cold tub in the physiotherapy area. There, per her 2015 lawsuit, Bouchard “was caused to slip and fall by a slippery, foreign and dangerous substance” on the tiled floor, and suffered a concussion. She withdrew from all three events in the U.S. Open. Bouchard’s trial against the United States Tennis Association began this week in federal court, with her lawyers claiming that the injury was “caused solely by the reason of the carelessness, negligence, wanton and willful disregard on the part of Defendant USTA.” Today, jurors found the USTA negligent and liable. Tomorrow, they will begin determining the damages owed to Bouchard. The USTA argued that Bouchard entered the locker room outside normal operating hours, and with no trainers present, brought this risk upon herself. Over the course of this trial, it has not been made clear which tournament employee applied the cleaning product—called Oasis 299—to the floor. Karen Owens, a supervisor, testified that it was applied by another employee, Christina Simmons, who in turn testified to say she was not given cleaning tasks involving chemicals given that she was seven months pregnant at the time. Bouchard testified that she felt a burning sensation when Oasis 299 made contact with her skin. 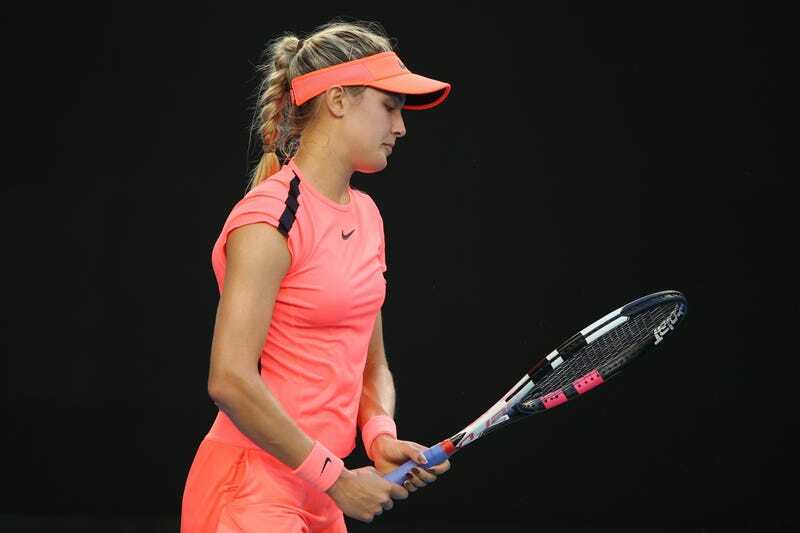 Bouchard’s lawyer Benedict Morelli said Monday that he was seeking “millions and millions” of dollars in damages, a vague number accounting for lost tournament winnings, sponsorship money, appearance fees, and other sources of income. “As a direct and proximate result of the injuries Ms. Bouchard sustained in the accident, she has been damaged and endured and continues to endure severe pain and suffering, and incurred and continues to incur significant economic loss, medical expenses, and loss of enjoyment of life,” Bouchard’s lawyers wrote in the suit. Now comes the most difficult part: How can you quantify how her career was affected? The jury assessed that the USTA was 75 percent responsible for the incident, and that Bouchard herself was 25 percent responsible. There’s reason to believe that Bouchard, who was struggling even before the concussion, did not quite have her playing career derailed by this injury; she was 15-15 on the season going into the U.S. Open, and had dropped to No. 25 in the WTA rankings. One could also argue that her image has not been meaningfully damaged, given her appearance in two straight Sports Illustrated swimsuit issues, among other sponsorship deals and public appearances. Maria Sharapova Loses To Her Biggest Hater, Exchanges Awkward "Handshake"